Why should you use aluminum louvers? Consider these three big advantages. If you’re familiar with louvers, you may be aware of the benefits. These slotted fences can allow light and air to come through all while keeping dirt and debris out, making them ideal for certain facilities, especially if you have an air conditioning unit or generator that needs good airflow. There are all kinds of styles of louvers, but the most common building material for them is aluminum. Let’s take a look at why aluminum is such an ideal material for louvers and what benefits aluminum louvers can offer you as a business owner. 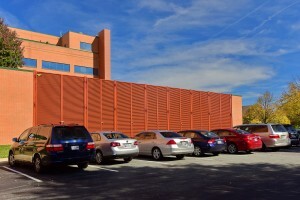 Louvers, like other kinds of fencing, are outdoors constantly. That means they need to withstand the elements that come their way, including rain, wind, and snow. Some materials handle weather conditions better than others and aluminum is one material that can certainly handle anything nature throws at it. Not only is aluminum rust resistant, but you also don’t have to worry about it fading over the years. This leaves you not having to worry about your louvers and allows you to focus on getting your job done instead. Need a generator protected? Looking for a way to make your property look more professional? Whatever your needs may be, louvers are a fantastic option to work with. Aluminum also contributes to this flexibility, as it’s good for whatever scenario that may pop up. It can be used no matter what the terrain is, from grassy knolls to dirt paths, so you can be sure to get the coverage you really need. These days, many people are rightly concerned about the environment. This is especially a concern when it comes to building practices, which can sometimes have a pretty negative impact on the environment. Thankfully, aluminum is a very eco friendly material and can benefit the planet a great deal. It’s completely recyclable, meaning it won’t ever have to end up in a landfill. Besides, thanks to its durability, you won’t have to worry about replacing your louvers any time soon. This entry was posted on Friday, August 31st, 2018	at 11:18 am	. You can follow any responses to this entry through the RSS 2.0 feed. Both comments and pings are currently closed.